Get Booze Bottles At Duty Free Prices At This West Delhi Bar! 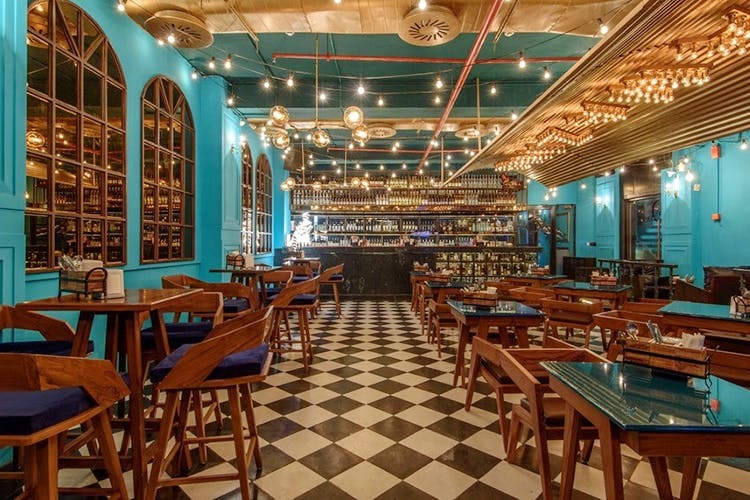 Duty Free is a café-slash-bar in Rajouri Garden with a new concept that’ll have you sipping through the day (and the night, of course). Be it a couple of beers and nachos while you finish your college assignment, the much-needed multiple rounds of drinks post work, or an rager through the night, Duty Free will work as your pit-stop for any mood. They’ve positioned themselves as a co-working space, a café, and a bar, so you can literally spend your whole day here. Duty Free has a regular bar where you get your favourite drinks and cocktails and a second ‘duty free’ bar where you can buy liquor by the bottle at reasonable prices (you can’t take the bottle out of the bar, though, so please be prepared to finish it). And, since everyone needs to munch when they drink, every drink at Duty Free comes with its own distinct chakhna! They’ve got comfort food like Kulhad Wale Rajma Chawal for those classic Old Delhi feels, Dhokla Chaat for some desi fusion, and Cassata ice-cream for a kick of 90s nostalgia. They’ve also got the usual comfort food and a salad menu for the odd weight-watcher. They also suggest you try their signature Only @ DF cocktail (we know we will).